Desde do lançamento do programa de certificação em setembro de 2018 a Microsoft Learning recebe uma enorme quantidade de comentários sobre os requisitos para as nossas certificações. Eles decidimos modificar os requisitos de certificação para o Azure Administrator Associate. A partir de 1 de maio de 2019, você só precisará passar um exame o AZ-103: Microsoft Azure Administrator para ter a certificação. Este novo exame combina as habilidades cobertas em AZ-100 e AZ-101, com a maioria do novo exame proveniente do AZ-100. 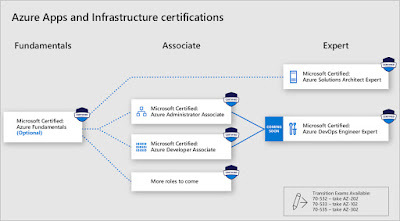 If you have taken and passed AZ-100, you will automatically be awarded the Microsoft Certified: Azure Administrator Associate certification on or around May 1, 2019. Congratulations! 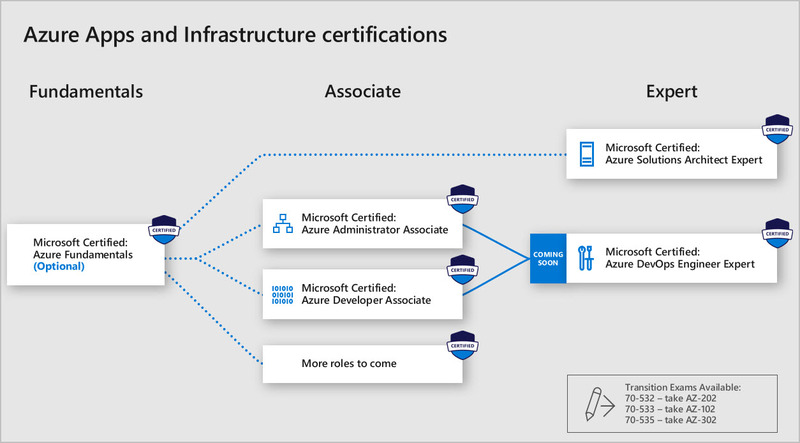 If you have registered to take AZ-100 between now and May 1, 2019, choose to take it, and pass, you will earn the Azure Administrator certification on or around May 1, 2019. If you have registered for AZ-101, choose to take it, and pass, you will earn the AZ-101 exam badge. You will be able to share this badge with others to demonstrate additional skills in the Azure Administrator space. Learn more about badging. If you have taken AZ-101, you will receive an exam voucher (regardless of if you passed or failed) that can be used for any Microsoft exam delivered through Pearson VUE as our thanks to you for being early adopters of our new certification program and helping us to better understand the certification needs of Azure Administrators so that we could simplify the process going forward. Instructor-led training and online training (MOOCs) will be updated and available on May 1, 2019; the free learning content on Microsoft Learn will be complete around July 1, 2019. For those of you who have been preparing for one or both of these exams, you can see how the new exam aligns to AZ-100 and AZ-101 in the attached document, AZ-103 OD with Alignment to AZ-100 and AZ-101.pdf. 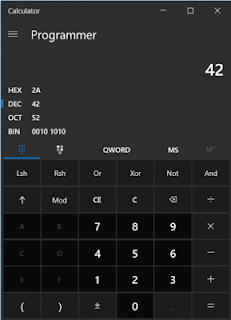 During March 2019, you can save 25% on ALL Microsoft Official Practice Tests purchased at mindhub.com. You can have access to the test for 30 to 60 days. To claim this offer, you should enter the promotional code MCP25 at checkout. This Offer ends March 31, 2019. Microsoft has made available the source code for their calculator that is included with the Microsoft Windows operating system. The documentation can be consulted here. The source code is great for anyone who wants to learn how to create applications in XAML even though the programming language used is in C ++. Windows 10, version 1803 or newer. Latest version of Visual Studio. 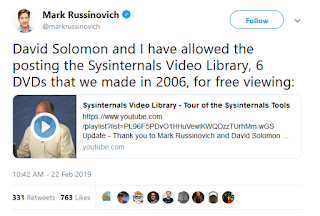 David Solomon and Mark Russinovich have allowed the posting the Sysinternals Video Library, 6 DVDs that they made in 2006, for FREE VIEWING. We’re both okay with you posting them. Despite being from 2006 has its historical factor. Microsoft standard courses are used when technology changes, functionality, new versions and updates. These are the following courses that will be removed. You can consult the list of upcoming exams scheduled to retire here. You can view course retirements history here. The Microsoft Virtual Academy (MVA) will be deactivated on January 31, 2019. This means that you have until this date to arn your certificates of completion in the MVA. Does this mean that Microsoft will end the free documentation? No. The MVA will be replaced by Microsoft Learn. Microsoft Learn uses the docs.com domain that was used by a Microsoft service competing with Slideshare. But Microsoft deactivated it on December 15, 2017 and forced users to move all their documents to other platforms. The statement is still available and can be found here. Microsoft Learn is the new platform where you can learn about various Microsoft products. Some advantages and disadvantages of Learn. Exam Preparation Documentation is not available in Learn. You must use Channel9 or official channels on YouTube like Ignite. For those who like slides, Learn does not provide slides. If you find any errors in the documentation or it is out of date, you can edit. This is possible because the documentation is in GitHUB which allows anyone to collaborate. All changes are not changed immediately, it is passed through several validations before being published. More information here. Cost reduction. For example in some areas like Azure, you do not need to use your own subscription. Temporary access is provided so you can trial settings, and more. EdX is not from Microsoft, it is an open, non-profit online course platform. They partner with organizations and universities. You can even use their platform to create your online courses. Microsoft has its own 'channel' in https://www.edx.org/school/microsoft. However not all courses are available but there is Microsoft Learning Partners (training company) that has its own private EdX platform and they are the ones that define the courses to be made available and prices. All costs are borne by the training company. Who wins with this? Everyone. If the partner defines that the courses are free the trainee has access to all information for free. If the partner defines that the course is paid, to have access it is necessary to acquire. How can I find the training companies that offer these types of courses? There is no public list. You will need to use Internet search engines. I will not mention any of them either. It would benefit some and hurt others. 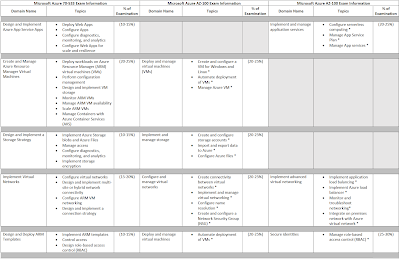 Does the Microsoft Azure AZ-100 exam replace 70-533? What about AZ-101? 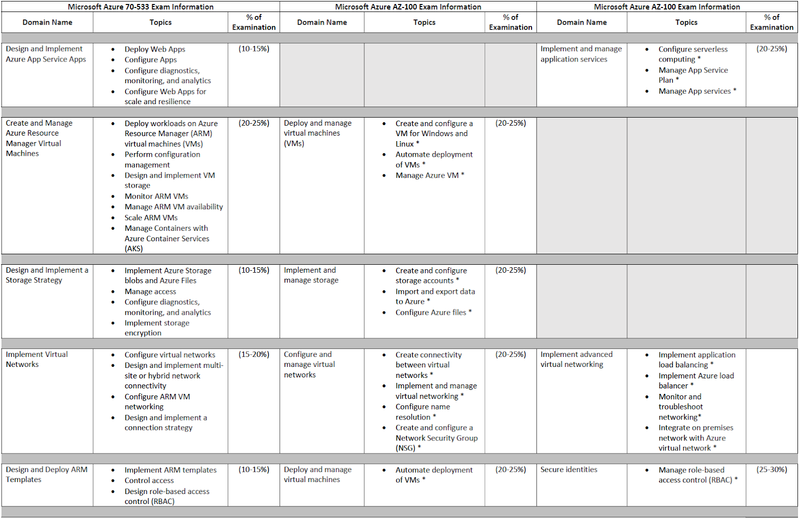 I have received some questions about the Microsoft Azure AZ-100 and AZ-101 exams and have decided to create a publication of the various questions I have received about them. Exam 70-533: Implementing Microsoft Azure Infrastructure Solutions, certifies system administrators in Microsoft Azure, which guarantees a Microsoft Specialist certification. In conjunction with the AZ-532 or AZ-534 has the MCSA certification. With all three you have the MCSE certification. But this was discontinued on December 31, 2018, due to the various changes and innovations of Azure services. The current exam was sometimes outdated. For those who were to take the exam he had to answer questions where services no longer existed and their prices were not what they were being practiced. Do you have the 70-533? Yes, then you will only need to take the AZ-102 transition exam until June 30, 2019. No, then you will have to take two exams the AZ-100 and AZ-101. Does the AZ-100 and AZ-101 allow the continuation and/or renewal for the MCSA and/or MCSE? No, these are part of a new certification. Do the new exmas have the same content as 70-533? The content of the AZ-533 was divided into two exams and updated with the new services. In my modest opinion the division was not well made. Because we talk about network in the AZ-100 and the other part of networks is in the AZ-100. The following images demonstrate the differences between the 70-533 with AZ-100 and AZ-101. The AZ-102 is the 70-533 transitional exam. It is a delta between the AZ-533 and AZ-100 + AZ-102. For those who have the AZ-533 do not need to do both exams, you only need to do this that entitles you to a new certification. This exam is available until June 30, 2019. I have the AZ-533, do I have to do the new certification? I always recommend upgrading your certifications. Iso demonstrates companies that are well prepared.